Not being a great admirer of the divisions that religions have brought to the World, I felt less than enthused by the prospect of learning more of divisions within one specific religion. 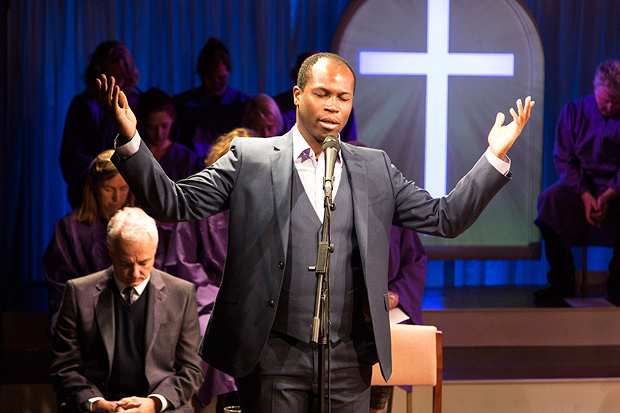 Lucas Hnath’s play begins with an all-female choir singing gospel songs; the setting is a thriving American church, but its Pastor (William Gaminara) is about to preach a sermon questioning the existence of Hell, bringing about a rift in the church led by its Associate Pastor (Stefan Adegbola). Hnath argues both cases with great clarity and weaves in personal relationships of protagonists and church politics to make an absorbing 85 minutes of subdued drama that is acted convincingly. However, from the perspective of a bystander, the big question is why these people can’t just get their acts together and practice what they preach.